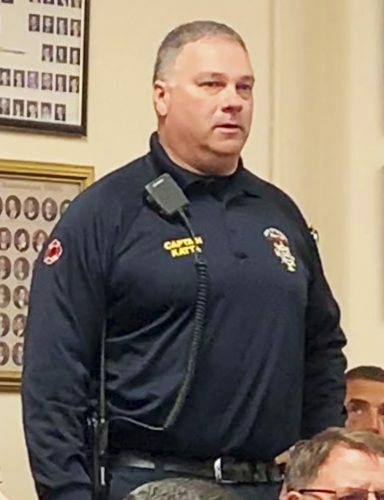 OBSERVER Photo by Jimmy McCarthy During last week’s meeting, Fredonia Mayor Athanasia Landis recognizes firefighters and EMTs who helped save the life of resident Donald Skelly on May 16. Pictured from the left are Donald Skelly, Fire Chief Ryan Walker; EMT student Tyler Cloos; firefighter and EMT Tyler DiRusso; Firefighter and EMT Tyler Bayles; and firefighter and EMT Ken Haas. Missing from the picture is firefighter and EMT Ryan Fisk. 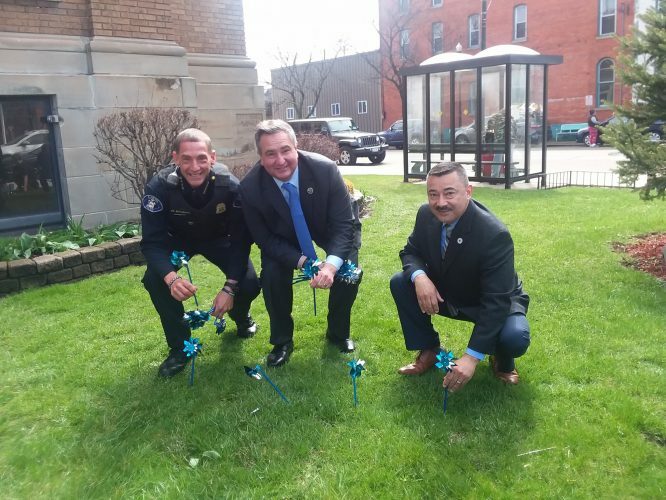 A village resident found unresponsive in May is alive today thanks in part to the swift, life-saving care provided by the Fredonia Fire Department. 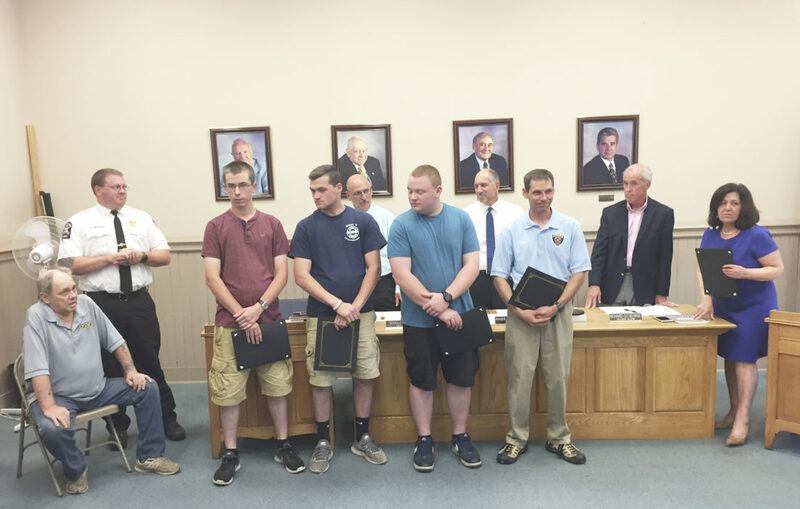 During last Monday’s Fredonia Village Board meeting, five firefighters and EMTs were recognized by village officials for their efforts in saving the life of resident Donald Skelly. A little before 9 p.m. on May 16, the fire department was dispatched for a male with possible stroke. EMT student Tyler Cloos was first on the scene as he arrived about two minutes after the call. Upon arrival, Cloos found Skelly unresponsive with no pulse and abnormal breathing. He subsequently performed CPR. Shortly after, firefighters and EMTs Tyler Bayles, Ryan Fisk and Tyler DiRusso arrived and assisted. In the meantime, firefighter and EMT Ken Haas stopped by the fire station to pick up a medical bag and defibrillator. Haas arrived at the scene 10 minutes after the call. Working professionally and fast, they were able to save Skelly’s life. Before the commencement of Monday’s meeting, Mayor Athanasia Landis took a moment to recognize and present a certificate of appreciation to the five members for saving a grandfather, father and member of the community. Skelly was also in attendance as he looked on along with his family. 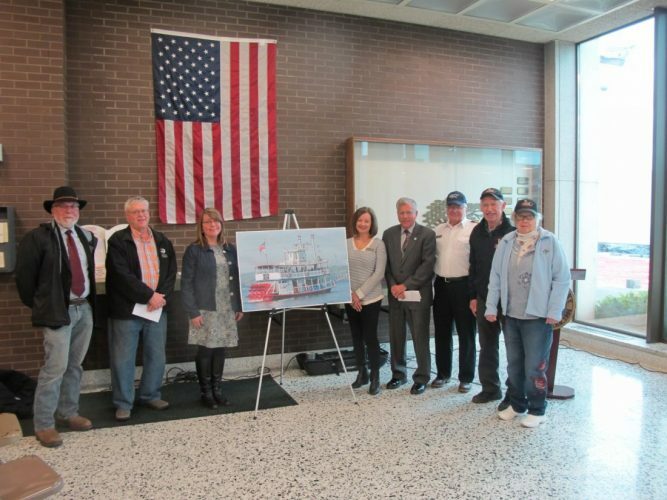 “Firefighters Cloos, Bayles, Fisk, DiRusso and Husk actions are indicative of their character and work ethic as members of the Fredonia Fire Department,” Landis said. “It is my hope that your example will inspire others for years to come,” Landis said.